Mossel Bay is part of South Africa’s Garden Route and a rather quaint seaside town with a working harbour. Most visitors pop in as they explore the Garden Route. It has some great history and architecture too as well as being a good jump off point for whale watching and shark cage diving. Shark monitoring and conservation as well as well protected and monitored reefs. Cameras are stationed to spot fishing and poaching activities. The weather is generally mild and happily receives 80% of its rain in the evenings. The coldest months are July to October with temperatures ranging between 13-18°C (55-64°F). The warmest months are December to March when temperatures range from 18-23°C (64-73°F) The wettest months are March, April, May, September, and October. On the whole, the diving is on shallow 2-8m (7-26ft) colourful reefs. Expect to see large red romans, octopus, black tail, feather worms, sea fans, basket stars and a multitude of colourful sponges. Santos and Mitches Reef are such sites. Butterfly Wall is also shallow, 8m (26ft) but of note as it attracts tropical fish in the warmer months. Sponge Reef is deeper 22-25m (72-82ft) and great for macro lovers. Windvogel is the more hectic dive due to depth (max 33m/108ft) and strong currents but the intrepid could be rewarded with large fish actions, sharks and maybe seals too. While not scuba diving per se, anyone can go and see great white sharks from the confines of a cage of course. If you are not stopping in while driving along the Garden Route then you can fly into George Airport. 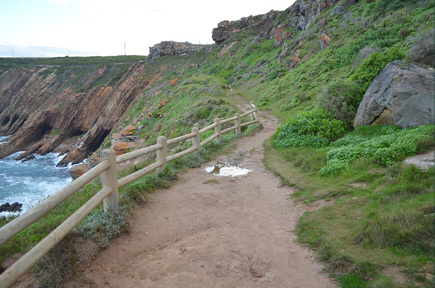 Mossel Bay is a little over half an hour drive from the airport. As you might expect from a harbour town, you will find fish and seafood restaurants a plenty and even sushi too. There’s steak, tapas, Indian and African fair, eat inside, poolside or beachside. As typical of this area, enjoying the great outdoors, is what it's all about with numerous national parks and over 20kms of beach close by. Go underground to Cango Caves, mosey around the various museums, visit St Blaize Lighthouse or conversely parasail or learn to play underwater hockey. Cango Wildlife Park is about an hour from Mossel Bay and has numerous inhabitants to enthral kids of all ages. The shallow calm reefs are suitable for junior divers. Book ahead if you are planning to go in December. My name is John I am 67 my wife is Joanna (64), we are both experienced and qualified divers (and still basically fit), Dived at Red sea, Maldives, Seychelles, Cape town. We have not dived for more than a year and have never dived at Mossel bay. We would like to get back into it, we live in Oudtshoorn.